The application for GFWC’s Success for Survivors Scholarship opened last week and will remain open until February 1, 2019. Initiated in 2012, the scholarship provides survivors of intimate partner violence with financial support as they seek higher education. To recognize Domestic Violence Awareness Month this October, promote the scholarship in your community and share the opportunity on your social media networks. Take it a step farther and partner with an alumnae organization from a local college or university to create the “Go Forward With Confidence” Scholarship, or GFWC Scholarship for short. It’s an opportunity to expand the Success for Survivors Scholarship, increase its visibility, and help students in your community. The scholarship is only made possible through generous donations, so dedicate your next fundraiser to supporting the GFWC Signature Project Fund! Your contributions will help GFWC change more lives and give survivors a better tomorrow. The GFWC Service Guild of Covington (Georgia) and the GFWC Morehead Woman’s Club (Kentucky) are featured on GFWC’s Blog. The next phase of Google’s stricter standards occurs next Tuesday, October 16. It’s time to act if you haven’t already. If your club website isn’t in compliance, that will reduce its visibility in Internet searches. It will also give a security warning that will drive away visitors trying to look at your site. Your website is the public face of your club, so make sure it gets seen! For more information, read our Summer Membership Quarterly. Don’t forget to share what international opportunities GFWC has given you on our “International Affiliates” post! Don’t forget to plan how you can support women in the military this Veteran’s Day. In case you missed it, read over some of our project ideas! The WHRC Advancement Guide in the Club Manual has been updated to reflect the current services of the WHRC and the WHRC Committee. For more information on the WHRC, donating to the WHRC, and what your club can do to preserve its history, read the Club Manual. Nationwide® provides affordable pet health coverage from preventive care to significant medical incidents. As a GFWC member, you’re eligible for preferred pricing which makes this peace-of-mind protection even more affordable. Find out why Nationwide is the #1 choice in America for pet insurance. To enroll or get more information, contact 877-738-7874 or visit their website. 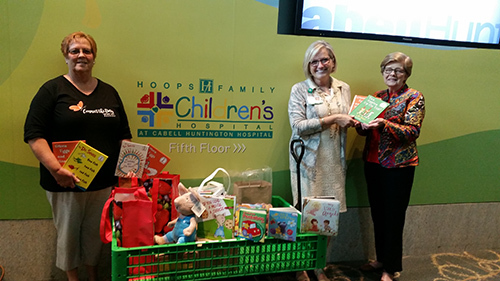 At Hoops Family Children’s Hospital with Julie Bibbee, GFWC WV Special Project Chairman on the left, Kristi Arrowood, Cabell Huntington Foundation Director, Pamela McCoy, GFWC WV President. GFWC West Virginia’s President and Director of Junior Clubs have a very special project for the next two years. The project is an effort to recognize the children’s hospitals in West Virginia by assisting them in the care of children and the growth of their facilities. Many clubs have plans for galas, walks, raffles, auctions, and spaghetti dinners in the coming months. The overall theme is “Connect the Dots,” and Summer Conference held in August provided an opportunity to begin planning and following through with connecting the dots. Children’s books were collected and money was raised to purchase additional books. 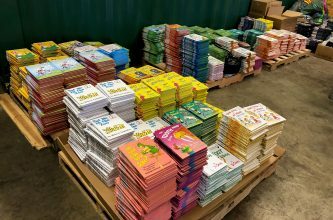 Three hospitals in West Virginia, WVU Children’s Medicine in Morgantown, Hoops Family Children’s Hospital in Huntington, and CAMC Women and Children’s in Charleston, will receive the books. Last week, book deliveries began, which were supplemented by the GFWC Woman’s Club of Point Pleasant and The Woman’s Club of Huntington. The membership card referenced here is not a GFWC membership card. This is an Office Depot/GFWC co-branded discount card which is currently being distributed at region conferences. If you would like to order this discount card for your club and/or club members, please email Jennifer Simpson, jsimpson@gfwc.org with the number of cards you need and the address where you would like them to be sent. The GFWC Concord Contemporary Club (New Hampshire) held their 2nd annual Mr. Concord Pageant to benefit the local domestic violence shelter. Eight local male contestants vied for the title, sharing a talent and answering the same interview question: “If you are chosen, Mr. Concord, how will you raise awareness in our local community about domestic violence and our shelter?” The event raised $15,000 and increased community awareness about domestic violence and the services of the shelter. The project was listed in the GFWC Top 10 Projects. There’s still time to register for the 24th annual Johns Hopkins Medicine’s A Woman’s Journey conference. Time: 8:15 a.m. – 4:30 p.m. Attend two keynote speakers, select four out of 32 seminars all featuring Johns Hopkins Medicine experts, and attend Ask the Experts, which provides access to additional Hopkins physicians. Our new International Pin is a beautiful reminder of the global reach of the volunteer spirit and all of the international relationships GFWC has forged through the years. They’re now available for $5 each at the GFWC Marketplace! Simply provide your name, mailing address, email, and club name to gfwc@gfwc.org! 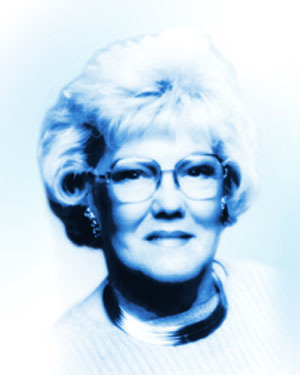 Lorraine Gorham is one busy clubwoman. Not only is she a wife, mother, and grandmother, she is also a member of seven clubs and serves as a club president and state chairman.